This Copper foil, Paper/Polypropylene/Oil cap yields the most natural sound I have heard to date. This cap differs from other caps in that it is not application specific. Instead of focused improvement in one place or another, it is just purely musical across the range. Warmer and richer than any plastic cap. Not "just darker" like some cheap oil filled.... or polyester... Detail and transparency that is real, not pseudo qualities like those found in so many caps today. No "two steps forward, and one back" here. Check the dimensions because these caps are not small. The leads are twisted pairs of 20ga solid Copper. This twisted pair would require a through hole (via) larger than 0.065" (1.65mm). Short lead is on the "stripe side" which indicates shield, and exceeds 2" in length. Tolerance is better than 5%, Dissipation Factor is better than 0.0035% at 1kHz. 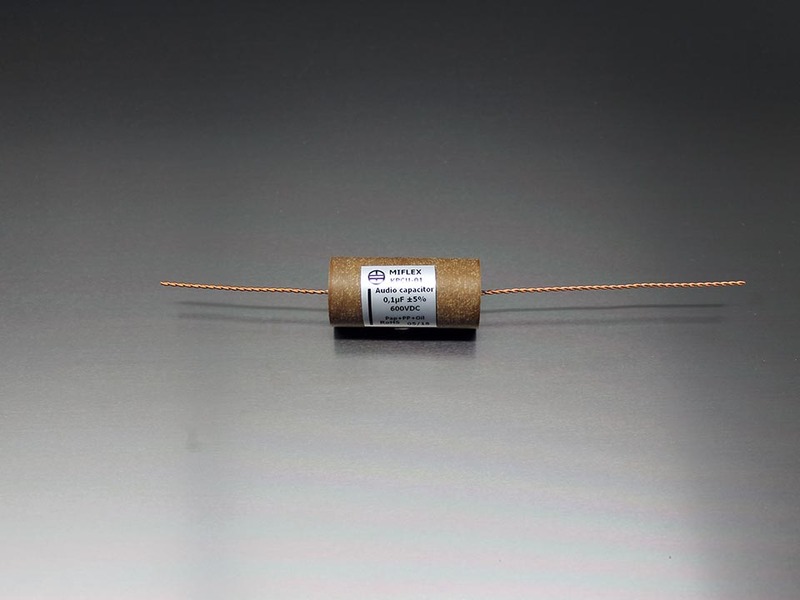 600VDC Dimensions: 0.945" diameter by 1.97" in length.